We’ve got a new all-time favorite meatless meal, and I am excited to share it with you today! I don’t normally like to call for “special ingredients” in any of my recipes, but the smoked salt is an exception to the rule. And for a good reason. BUT you could totally sub regular salt if you don’t feel like buying something extra (and you don’t regularly experience FOMO – haha), but I really can’t recommend it enough both here and the one other time I’ve called for it (in our wing recipe). See it won’t go to waste! And it really does take this recipe from really good to amazing … can’t wait to hear what you think of it. 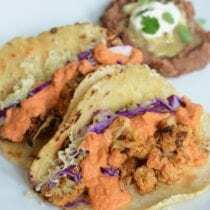 Even your biggest meat lovers will not be missing a thing with these vegetarian tacos … I’ve seriously never seen my kids scarf down veggies so fast! Oh and this is a great recipe to double while you’re at it (just the cauliflower since you’ll already have extra sauce). They are just as tasty the next day and, as we’ve discussed, when you cook from scratch this often—leftovers are the bomb! 1/2 teaspoon smoked salt, you can sub regular salt, but then these won't taste smoky! 1 teaspoon smoked salt, again, you can sub regular salt but the smoked salt is SO worth it! Preheat oven to 400 degrees F. Cut cauliflower into 1" bite-size pieces, big stems removed and discarded. Place on large baking sheet. In a small bowl mix the spices. 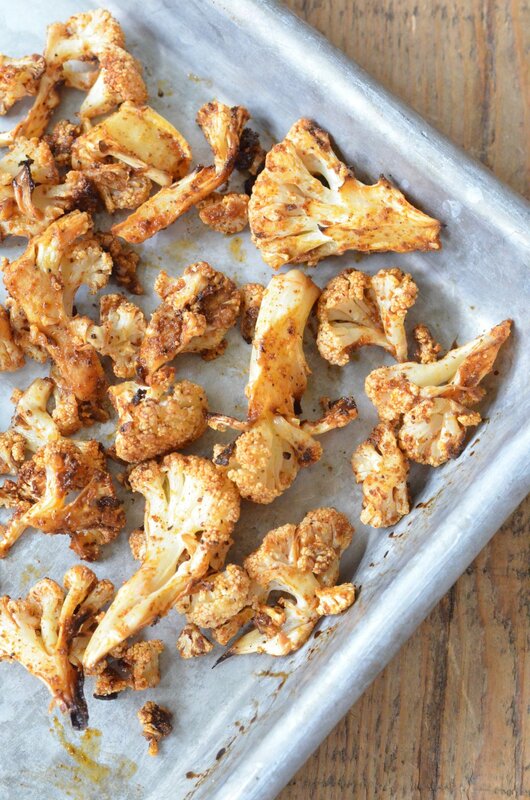 Drizzle the olive oil, lime juice and then the spices over top of the cauliflower. Toss to combine. Bake until tender when pierced with a fork, about 20 minutes. Blend all ingredients until smooth. Serve at room temperature or warm. Reserve half of the sauce for leftovers (lucky you)! 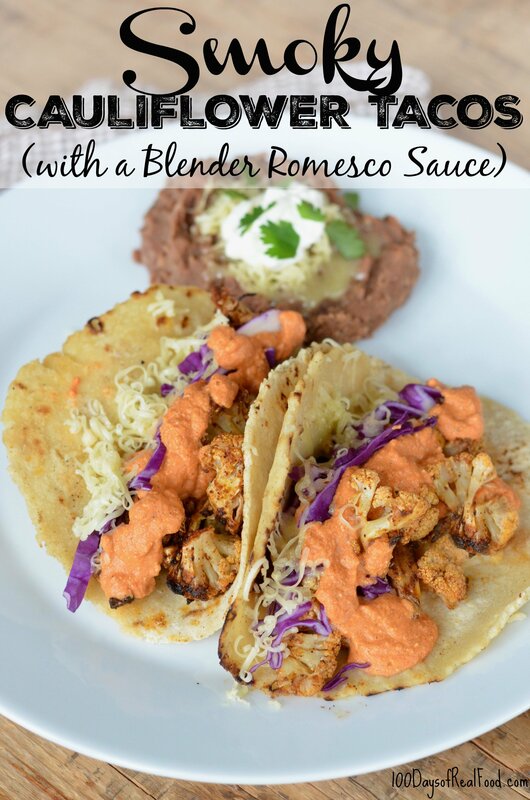 Serve roasted cauliflower and Romesco sauce with corn tortillas, grated cheese, sliced red cabbage, fresh cilantro, avocado and whatever else you love to have on your tacos. hey.. thats nice.. i love to explore new foody places to enjoy the taste. Don’t discard the stems. Save them for veggie soup or minestrone soup!! Made this last night and loved it! I forgot to buy pimentos so I subbed a handful of pimento stuffed olives, which was delicious. We used a small package of cauliflower so have a ton of leftover sauce, any suggestions on how to best use it? I use it on veggie sandwiches. Made these tonight. My vegetarian son and meat eater son love them! Will make them again! This looks great! Can’t wait to make it for dinner tonight. One suggestion…add the corn tortillas to your list of ingredients. Thank you! What can you substitute for the raw almonds in the sauce if you have a nut allergy? While we’ve not subbed here, you could use sunflower seeds or pepitos. I wonder how it would be to use some smoked paprika and regular salt. I already have smoked paprika in my spice cabinet. I love smoked paprika. Let us know what you thought. it is a different type of tacos recipe. These are amazing! I could not find smoked salt, but anxious to try them again with it.